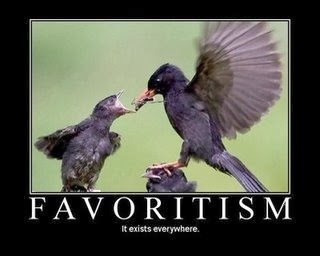 Favoritism is giving favor to someone whether he is deserving of such favor or not. This often leads to being unreasonable with our responses with different situations. Examples of favoritism are teachers who give more attention or appreciation to a selected students and being biased with judgments. It is not healthy for someone to practice favoritism because it will lead to imbalance and unhealthy dealing with situations. When someone favors someone, he has to show the same favor with others also. This is being fair. For those who are going to take a lawyer course, it is important and beneficial for them to practice crushing favoritism because they might be installed as judge or hold a higher position that require sound judgment and decision-making. If he is biased, he will find it difficult to decide and is prone to monkey businesses. This is a sad truth. Being fair has so many benefits. And it is achieved by crushing favoritism first. We cannot avoid favoring someone but as much as possible we have to control ourselves and look at the both sides of the coin especially when we are making judgments. Life is more colorful when we are fair. We can avoid guilt when we show fairness to people. Also, when you have children, you can apply this idea with them. You will have a hard time nursing them when you give favor to one and single out the others. Being fair is also a sign of maturity. Only matured people are able to live with this kind of attitude.